Over the years there have been many different video game consoles, and many different types of televisions were instrumental in playing the games. Style, visual quality, and functions may have changed with time, but TVs, like everything else, are a product of their generation. Some televisions have become just as iconic as the game systems they supported. Gaming TVs give your game room a unique quality, and here are three examples that you don’t see every day. 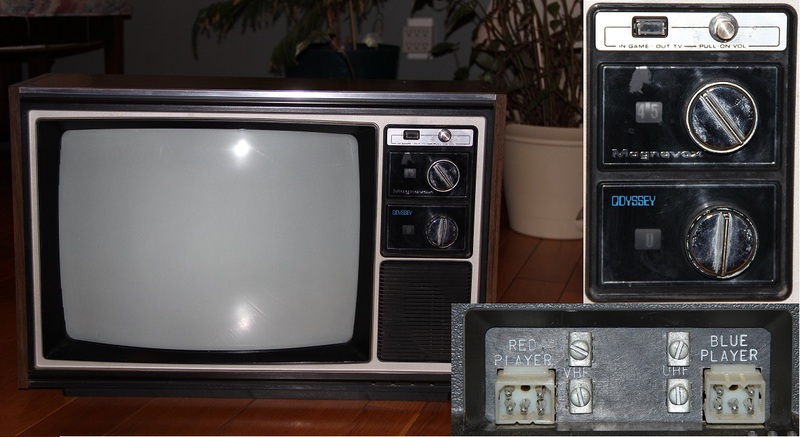 Released in 1976, the Magnavox 4305 television was the first television/video game combination. That’s right, the game is actually built into the television. With the push of a button, this TV goes from playing your favorite television shows to playing different variations of Pong. What made this especially nice was that the Magnavox 4305 version of Pong was presented in color, a feature not available in the standalone Pong consoles of the time. The TV itself packs a 19” screen encased in wood grain, matching not only your Atari 2600 but also the walls of your parents’ basement. The idea of this television is straight to the point. Press a button and the game starts. There is no main menu, and there is no pause button. You turn the game on and it’s instant action. Instant two player Pong action. That’s it. The proprietary red/blue controllers consist of a spinning knob used to move your deflector piece in Pong and a button that is used to cycle through the different versions of the game. All games work with the same rules in play, but with different situations. Like many old games, it uses the format of one cart and many versions of the game. This TV really was a big advancement in gaming. Someone somewhere saw that video games would eventually make their way into the household and attempted to capitalize on it. Even though the idea didn’t explode with interest, the Magnavox 4305 is a beautiful relic of classic gaming. Pong is still just as addicting now as it was 30 years ago and using it here was a perfect fit. The only downside is the hardware on the television set. Because this TV is so old, the input jacks are VHF/UHF jacks. In order to connect other game consoles to it, you need a converter switch box like the one that came with the Atari 2600 or the ColecoVision. 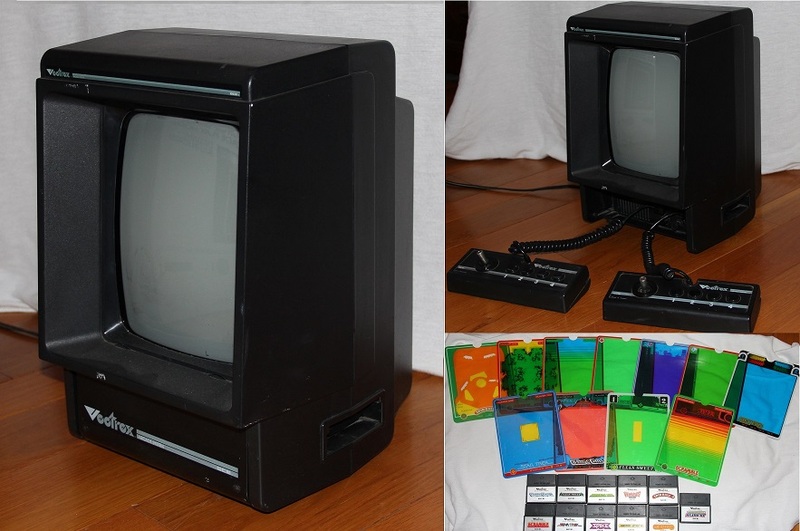 The Vectrex is an all-in-one gaming console that was released in 1982. It sports the console, the screen, the controller, and a game all built into the unit. The Gameboy can’t even lay claim to all of that. It even has a handle built into the back of it making this system as portable as a home console can possibly get. However, unlike the other two examples in this article, this screen is not able to broadcast television signal. The Vectrex has a vector screen used to display the system’s vector graphics. Games on this system are very bright and crisp. The major downside is the screen is only black and white. The solution for this was the use of transparent colored overlays that are held onto the system by clips. These overlays are responsible for bringing color and other visual enhancements to their respective games. The game library for the Vectrex is small with only 31 official games, but the quality of the games are high overall. Some are just varied ports of other games released for other systems or arcades. The built-in game on the system is called MineStorm and it plays a lot like Asteroids. Another game called Clean Sweep plays like Pac-man. The difference is that your character is a vacuum cleaner sucking up pellets. When your bag is full, you have to empty the contents in the middle of the screen in order to continue collecting the remaining pellets. There are unique games on the system too, like the quirky 3D platformer Spike or Star Trek: The Motion Picture. The controller for the Vectrex is very simple: there is a joystick and 4 buttons. It actually resembles the controller for the Neo Geo AES console, except that it is smaller and simplified. The controller is made well, it works well with the games, and it fits into the console for storage and transportation. There is a secondary controller port in the console that is exposed when the first controller is folded out of the system. However, the second controller has no spot to be stored in the Vectrex. There was a lot of creativity and thought put into the Vectrex. It had a light pen that could be used for drawing in certain games just by touching the screen. It also had a pair of 3D glasses that could be used with specific games. The Vectrex was full of innovation and even though some accessories were far before their time, unfortunately the system didn’t last very long. The Vectrex is quite an oddball console if I’ve ever seen one. I’d put it in the category of “Examples of gaming systems that were made once and then never done again”. It may be atypical and it may not be the most refined gaming system, but it’s not something you see every day. Though the system came and went, in the past few years it has started to gain popularity again. It has even received its own homebrew games and multi-carts created by fans. The 1990s was a time of very eccentric toys and cartoons, and the GX-TV fits the look of the 90s perfectly. It could have been a Pokémon with its two forms: closed up and protected, or opened up and ready to kick it. This TV not only screams with its components, but its look is very loud and impressive too. When I was a kid in the 90s, I remember seeing this TV at toy stores. It was used as a screen for whichever video game system was being promoted in a kiosk at the store. As soon as I saw the GX-TV, I fell in love with it. I really wanted it as a kid, and I still really wanted it as an adult. Even more than the great picture and excellent sound, the look of this television is what sets it apart from other TVs and really catches your attention. The GX-TV is a 13” television that really packs a huge punch. The picture is very crisp and clear, and the colors jump right out of this screen. There are two sets of composite inputs, one set of composite outputs, an antenna input, and an RF input. The extra RF input removes the need to daisy chain your cable signal through your RF input box. When it comes to sound, this unit has it in volumes. The screen cover doors double as the speaker mounts. There are three speakers in each of the two wing doors and a subwoofer above the screen. The sound on this television is incredible and it can get very loud. U.N. Squadron looks and sounds particularly excellent on it. The Samsung GX-TV is a welcome addition to any game room anywhere. It will instantly become a centerpiece in your collection and will start many conversations. If you have a chance to pick up this TV, buy it, hook up your favorite retro console, crank the volume, and enjoy. Take a short survey about our Marketplace and help us improve it.